References m_dThickness, m_iBorderThicknessConnect, m_pPreviewWidget, m_wApplyButton, m_wBorderColorButton, m_wBorderThickness, m_windowMain, m_wLineBottom, m_wLineLeft, m_wLineRight, m_wLineTop, m_wNoImageButton, m_wPosColumn, m_wPosPage, m_wPosParagraph, m_wPreviewArea, m_wSelectImageButton, m_wSetImageButton, m_wWrapButton, sThickness, and UT_convertToInches(). References AP_UnixDialog_FormatFrame__onBackgroundColorClicked(), AP_UnixDialog_FormatFrame__onBorderColorClicked(), m_iBorderThicknessConnect, m_wApplyButton, m_wBackgroundColorButton, m_wBorderColorButton, m_wBorderThickness, m_wCloseButton, m_windowMain, m_wLineBottom, m_wLineLeft, m_wLineRight, m_wLineTop, m_wNoImageButton, m_wPreviewArea, m_wSelectImageButton, m_wWrapButton, s_apply_changes(), s_border_thickness(), s_close_window(), s_delete_clicked(), s_destroy_clicked(), s_line_bottom(), s_line_left(), s_line_right(), s_line_top(), s_preview_draw(), s_remove_image(), s_select_image(), and s_WrapButton(). 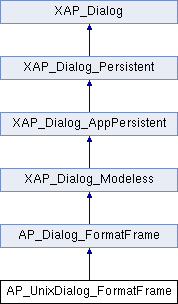 References abiDialogSetTitle(), AP_Dialog_FormatFrame::ConstructWindowName(), XAP_Dialog::getApp(), AP_Dialog_FormatFrame::getBottomToggled(), AP_Dialog_FormatFrame::getLeftToggled(), AP_Dialog_FormatFrame::getRightToggled(), XAP_App::getStringSet(), AP_Dialog_FormatFrame::getTopToggled(), label_button_with_abi_pixmap(), localizeButton(), localizeButtonUnderline(), localizeLabel(), localizeLabelMarkup(), m_wApplyButton, m_wBackgroundColorButton, m_wBorderColorButton, m_wBorderThickness, m_wCloseButton, AP_Dialog_FormatFrame::m_WindowName, m_wLineBottom, m_wLineLeft, m_wLineRight, m_wLineTop, m_wNoImageButton, m_wPosColumn, m_wPosPage, m_wPosParagraph, m_wPreviewArea, m_wSelectImageButton, m_wWrapButton, newDialogBuilder(), XAP_appendComboBoxText(), and XAP_makeGtkComboBoxText(). References AP_Dialog_FormatFrame::ConstructWindowName(), m_windowMain, AP_Dialog_FormatFrame::m_WindowName, AP_Dialog_FormatFrame::setAllSensitivities(), and UT_ASSERT. References AP_Dialog_FormatFrame::applyChanges(), FL_FRAME_POSITIONED_TO_BLOCK, FL_FRAME_POSITIONED_TO_COLUMN, FL_FRAME_POSITIONED_TO_PAGE, m_wPosColumn, m_wPosPage, m_wPosParagraph, and AP_Dialog_FormatFrame::setPositionMode(). References event_previewExposed(), m_dThickness, m_wBorderThickness, AP_Dialog_FormatFrame::setBorderThicknessAll(), sThickness, and UT_UTF8String_sprintf(). Referenced by s_close_window(), and s_destroy_clicked(). Referenced by AP_UnixDialog_FormatFrame__onBackgroundColorClicked(), AP_UnixDialog_FormatFrame__onBorderColorClicked(), event_BorderThicknessChanged(), s_line_bottom(), s_line_left(), s_line_right(), s_line_top(), and s_preview_draw(). Referenced by AP_UnixDialog_FormatFrame__onBackgroundColorClicked(), and AP_UnixDialog_FormatFrame__onBorderColorClicked(). References AP_Dialog_FormatFrame::ConstructWindowName(), FL_FRAME_POSITIONED_TO_BLOCK, FL_FRAME_POSITIONED_TO_COLUMN, FL_FRAME_POSITIONED_TO_PAGE, fl_ContainerLayout::getContainerType(), FV_View::getCurrentBlock(), XAP_Frame::getCurrentView(), fl_FrameLayout::getFrameWrapMode(), FV_View::getPoint(), AP_Dialog_FormatFrame::getWrapping(), FV_View::isInFrame(), m_windowMain, AP_Dialog_FormatFrame::m_WindowName, m_wPosColumn, m_wPosPage, m_wPosParagraph, m_wWrapButton, fl_ContainerLayout::myContainingLayout(), AP_Dialog_FormatFrame::positionMode(), AP_Dialog_FormatFrame::setAllSensitivities(), AP_Dialog_FormatFrame::setWrapping(), UT_ASSERT, UT_ASSERT_HARMLESS, and UT_SHOULD_NOT_HAPPEN. References _connectSignals(), _constructWindow(), AP_Dialog_FormatFrame::_createPreviewFromGC(), _populateWindowData(), abiSetupModelessDialog(), BUTTON_CLOSE, DELETEP, AP_FormatFrame_preview::draw(), XAP_App::getApp(), GR_UnixCairoGraphics::init3dColors(), AP_Dialog_FormatFrame::m_pFormatFramePreview, m_pPreviewWidget, m_windowMain, m_wPreviewArea, XAP_App::newGraphics(), AP_Dialog_FormatFrame::startUpdater(), and UT_return_if_fail. References m_dThickness, m_iBorderThicknessConnect, m_wBorderThickness, UT_convertToInches(), and UT_UTF8String::utf8_str(). References m_wApplyButton, m_wBackgroundColorButton, m_wBorderColorButton, m_wLineBottom, m_wLineLeft, m_wLineRight, m_wLineTop, and m_wWrapButton. Referenced by AP_UnixDialog_FormatFrame(), event_BorderThicknessChanged(), and setBorderThicknessInGUI(). Referenced by _connectSignals(), AP_UnixDialog_FormatFrame(), and setBorderThicknessInGUI(). Referenced by AP_UnixDialog_FormatFrame(), runModeless(), and ~AP_UnixDialog_FormatFrame(). Referenced by _connectSignals(), _constructWindow(), AP_UnixDialog_FormatFrame(), and setSensitivity(). Referenced by _connectSignals(), _constructWindow(), and setSensitivity(). Referenced by _connectSignals(), _constructWindow(), AP_UnixDialog_FormatFrame(), event_BorderThicknessChanged(), and setBorderThicknessInGUI(). Referenced by _connectSignals(), activate(), AP_UnixDialog_FormatFrame(), destroy(), getWindow(), notifyActiveFrame(), and runModeless(). Referenced by _connectSignals(), _constructWindow(), and AP_UnixDialog_FormatFrame(). Referenced by _constructWindow(), AP_UnixDialog_FormatFrame(), event_ApplyToChanged(), and notifyActiveFrame(). Referenced by _connectSignals(), _constructWindow(), AP_UnixDialog_FormatFrame(), and runModeless(). Referenced by _connectSignals(), _constructWindow(), AP_UnixDialog_FormatFrame(), notifyActiveFrame(), and setSensitivity().